Croce Rossa 3566 m is placed on the boundary ridge between Italy and France; due to the fact that the normal route is rather easy, it is the most climbed mountain of the area. 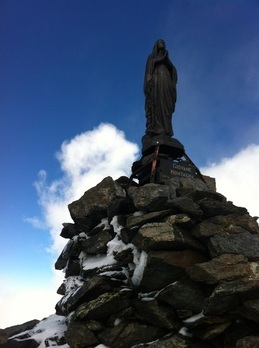 It was climbed the first time by Antonio Tonini in 1857, who reached the peak climbing the S-W slope. The name “Croce Rossa” (Red Cross) is given because of the strange red rocky structure placed on the S-E wall, visible from Peraciaval Lakes. 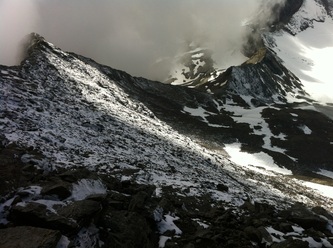 The track related in this page is the easiest route for the peak, approximately the track followed by the fist climber. Despite with no snow the track is suitable for expert hikers, with snow or glass ice axe and crampons are necessary. Moreover helmet is recommended, due to the fact that from the Colle della Valletta to the peak there is the danger of falling rocks. 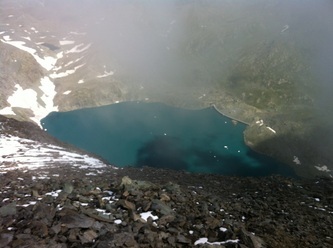 From the Rifugio Cibrario take the steep path that goes up to N-W to Laghi del Peraciaval 2762 m. After a steep stretch with a beautiful view on the Pian dei Sabiunin, the detrital flat land where the refuge is built, the path is less steep and reaches the first lake. Ford the outflowing river and follow the path which climbs the slope placed on the N-E of the lakes. The track turns right and arrives at the Colle della Valletta 3207 m, the mountain pass set between the Croce Rossa and the Punte del Peraciaval (55’). From that place to the peak there will be only a narrow path marked by little stony structures made by other hikers in order to mark the correct way. Form the pass turn right (N) taking the track that climbs diagonally the S-W slope of the Croce Rossa. Arrived at a rocky belt, before a little snowfield, climbe it keeping the right (pay particularly attention during this stretch in case of low visibility). 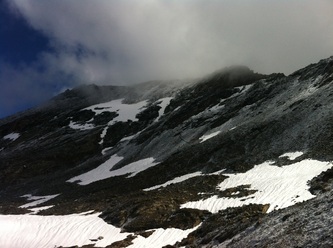 Passed that area, the path climbs the steep slope covered by detritus arriving on the ridge which starts from the Colle della Valletta, not far from the summit (1h 45’ from the Refuge). If near the rocky belt you notice some falling rocks, it is better if you leave the track followed during the ascent, climbing down to the Glacier de la Vallettaz, and reach the Colle della Valletta by snow and detritus. From that place to the Refuge following the ascent route (1h 5’). Click here for full screen map.